Sitting on the couch with my teenage daughters popcorn ready to go watching the final episode of Girlmore Girls over nine. Our usual routine was making sure we had our popcorn ready to go and sitting all together watching a show we have grown to love and look forward to week after week and year after year. Gilmore Girls brought us together every week with their quick wit and loving characters. Having had a close relationship with my daughters we could really relate to the relationship that Lorelai and Rory had. 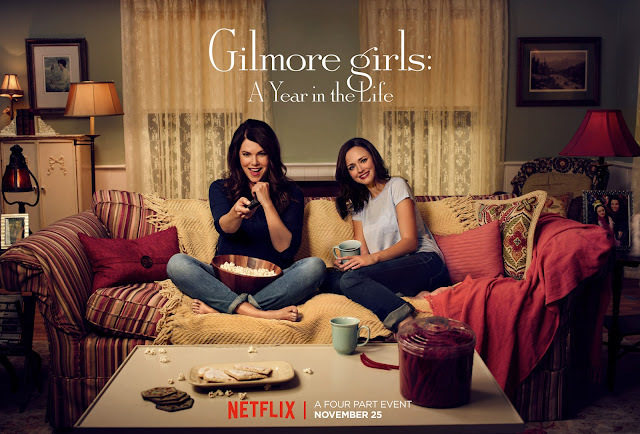 Even now with the upcoming 4 episodes of Gilmore Girls coming to Netflix next Friday I can not wait to share them with my now adult daughters. We will be watching them from different locations and cities this time around but it will not stop us from Face timing each other with our reactions and thoughts during the show. We also plan to rewatch them once they all return home for Christmas. Plan your date night with your mother or daughter and sit back and watch Girlmore Girls next week. I have been introducing my tween daughter to Gilmore Girls over the last few months so she can get ready for the upcoming episodes. Did you know that 62% of mothers and daughters say sharing TV shows helps build a stronger relationship. A recent survey revealed more than half of women (53%) wish they spoke to their mother more often. 39% of respondents say they’re two peas in a pod, and are BFFs like Rory and Lorelai Gilmore. 30% know it can be complicated like Lorelai and Emily Gilmore, but they can’t imagine life without each other. Are you gearing up for the return of Gilmore Girls to Netflix? Do you have another show you love to watch with your teen children or girlfriends?